We Drink Your Milkshake! 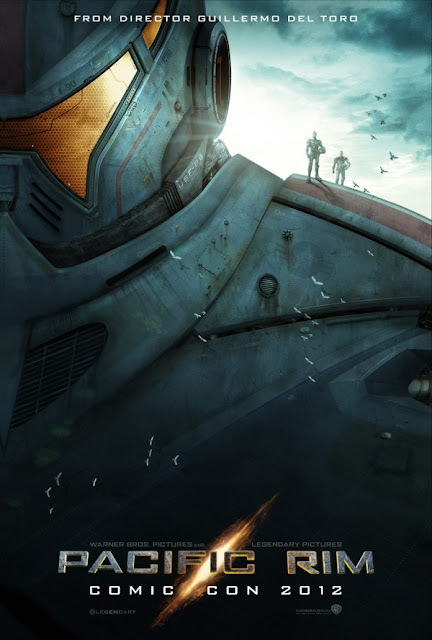 : Take the First Look at Guillermo Del Toro's Rowbits for his New Movie, PACIFIC RIM! Take the First Look at Guillermo Del Toro's Rowbits for his New Movie, PACIFIC RIM! Javi here. If you don't know, I'm a fan of robots. I'm also a fan of movies. I'm a bigger fan of robots in movies that are not directed by Michael Bay. With that being said, I am so excited for director Guillermo Del Toro's upcoming PACIFIC RIM. This was the project that was started after his previous movie, AT THE MOUNTAIN OF MADNESS, was cancelled. PACIFIC RIM, according to IMDB, is about "When an alien attack threatens the Earth's existence, giant robots piloted by humans are deployed to fight off the menace." Now, with this poster coming to you thanks to Badass Digest, shows the exact scale of the robots. That is to say, they're freaking huge! This movie is looking to be the culmnation of a lot of good things finally coming together, an actual Guillermo Del Toro movie, guys getting into huge robots and then figting monsters in said huge robots. This is basically a serious look at all of those crazy Super Sentai shows from Japan that inspired the robot/monster parts of the Power Rangers series. Plus, it stars Idris Elba. So what do you guys think? I'm really interested to see how they work on the scale of these machines and the monsters. I want to be in awe of them and I really hope that the movie gets this across. Stay tuned here for more news on the movie as they come to us. PACIFIC RIM is directed by Guillermo Del Toro, written by Travis Beacham and stars Idris Elba, Charlie Hunnam, and Charlie Day.